From the beginning of the project, Go was designed with tools in mind. Those tools include some of the most iconic pieces of Go technology such as the documentation presentation tool godoc, the code formatting tool gofmt, and the API rewriter gofix. Perhaps most important of all is the go command, the program that automatically installs, builds, and tests Go programs using nothing more than the source code as the build specification. The release of Go 1.2 introduces a new tool for test coverage that takes an unusual approach to the way it generates coverage statistics, an approach that builds on the technology laid down by godoc and friends. First, some background: What does it mean for a language to support good tooling? It means that the language makes it easy to write good tools and that its ecosystem supports the construction of tools of all flavors. There are a number of properties of Go that make it suitable for tooling. For starters, Go has a regular syntax that is easy to parse. The grammar aims to be free of special cases that require complex machinery to analyze. Where possible, Go uses lexical and syntactic constructs to make semantic properties easy to understand. Examples include the use of upper-case letters to define exported names and the radically simplified scoping rules compared to other languages in the C tradition. Finally, the standard library comes with production-quality packages to lex and parse Go source code. They also include, more unusually, a production-quality package to pretty-print Go syntax trees. These packages in combination form the core of the gofmt tool, but the pretty-printer is worth singling out. Because it can take an arbitrary Go syntax tree and output standard-format, human-readable, correct code, it creates the possibility to build tools that transform the parse tree and output modified but correct and easy-to-read code. One example is the gofix tool, which automates the rewriting of code to use new language features or updated libraries. Gofix let us make fundamental changes to the language and libraries in the run-up to Go 1.0, with the confidence that users could just run the tool to update their source to the newest version. Inside Google, we have used gofix to make sweeping changes in a huge code repository that would be almost unthinkable in the other languages we use. There's no need any more to support multiple versions of some API; we can use gofix to update the entire company in one operation. It's not just these big tools that these packages enable, of course. They also make it easy to write more modest programs such as IDE plugins, for instance. All these items build on each other, making the Go environment more productive by automating many tasks. Test coverage is a term that describes how much of a package's code is exercised by running the package's tests. If executing the test suite causes 80% of the package's source statements to be run, we say that the test coverage is 80%. The program that provides test coverage in Go 1.2 is the latest to exploit the tooling support in the Go ecosystem. The usual way to compute test coverage is to instrument the binary. For instance, the GNU gcov program sets breakpoints at branches executed by the binary. As each branch executes, the breakpoint is cleared and the target statements of the branch are marked as 'covered'. This approach is successful and widely used. An early test coverage tool for Go even worked the same way. But it has problems. It is difficult to implement, as analysis of the execution of binaries is challenging. It also requires a reliable way of tying the execution trace back to the source code, which can also be difficult, as any user of a source-level debugger can attest. Problems there include inaccurate debugging information and issues such as in-lined functions complicating the analysis. Most important, this approach is very non-portable. It needs to be done afresh for every architecture, and to some extent for every operating system since debugging support varies greatly from system to system. 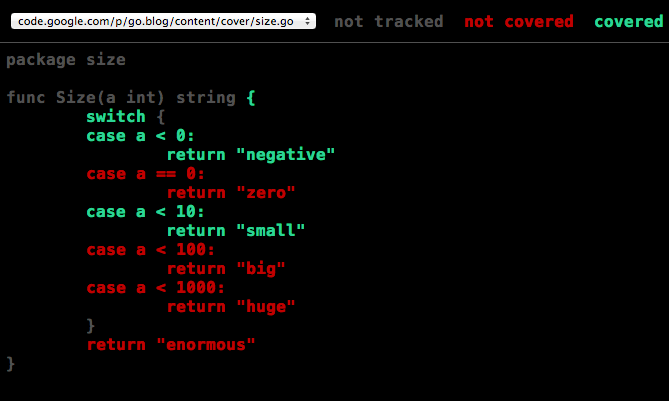 It does work, though, and for instance if you are a user of gccgo, the gcov tool can give you test coverage information. However If you're a user of gc, the more commonly used Go compiler suite, until Go 1.2 you were out of luck. For the new test coverage tool for Go, we took a different approach that avoids dynamic debugging. The idea is simple: Rewrite the package's source code before compilation to add instrumentation, compile and run the modified source, and dump the statistics. The rewriting is easy to arrange because the go command controls the flow from source to test to execution. Notice that the coverage is 42.9%, which isn't very good. Before we ask how to raise that number, let's see how that was computed. Each executable section of the program is annotated with an assignment statement that, when executed, records that that section ran. The counter is tied to the original source position of the statements it counts through a second read-only data structure that is also generated by the cover tool. When the test run completes, the counters are collected and the percentage is computed by seeing how many were set. Although that annotating assignment might look expensive, it compiles to a single "move" instruction. Its run-time overhead is therefore modest, adding only about 3% when running a typical (more realistic) test. That makes it reasonable to include test coverage as part of the standard development pipeline. With this presentation, it's obvious what's wrong: we neglected to test several of the cases! And we can see exactly which ones they are, which makes it easy to improve our test coverage. A big advantage of this source-level approach to test coverage is that it's easy to instrument the code in different ways. For instance, we can ask not only whether a statement has been executed, but how many times. The default is 'set', which we've already seen. The atomic setting is needed only when accurate counts are required when running parallel algorithms. It uses atomic operations from the sync/atomic package, which can be quite expensive. For most purposes, though, the count mode works fine and, like the default set mode, is very cheap. Let's try counting statement execution for a standard package, the fmt formatting package. We run the test and write out a coverage profile so we can present the information nicely afterwards. That's a lot of information about the execution of the function, information that might be useful in profiling. You might have noticed that the counts in the previous example were not what you expected on the lines with closing braces. That's because, as always, test coverage is an inexact science. What's going on here is worth explaining, though. We'd like the coverage annotations to be demarcated by branches in the program, the way they are when the binary is instrumented in the traditional method. It's hard to do that by rewriting the source, though, since the branches don't appear explicitly in the source. there is no attempt to separately instrument the calls to f and g, Regardless of the facts it will always look like they both ran the same number of times, the number of times f ran. To be fair, even gcov has trouble here. That tool gets the instrumentation right but the presentation is line-based and can therefore miss some nuances. That's the story about test coverage in Go 1.2. A new tool with an interesting implementation enables not only test coverage statistics, but easy-to-interpret presentations of them and even the possibility to extract profiling information. Testing is an important part of software development and test coverage a simple way to add discipline to your testing strategy. Go forth, test, and cover.